Join this 4-day tour with an informative and entertaining guide, including round-trip transport from Guatemala City. You’ll learn about local history and culture of Antigua and Guatemala City. Explore the colorful market of Chichicastenango. When you arrive in Guatemala City, your guide will greet you at La Aurora International Airport (GUA) and transfer you to your hotel in Guatemala City. After hotel pickup, transfer to Antigua, meaning Old Guatemala, which is about 45 minutes west of Guatemala City. A UNESCO World Heritage site. Follow your guide on a 3.5-hour easygoing walking tour of the old city, checking out its top attractions and strolling along its cobblestone streets. Visit Central Park (Parque Central), Palace of the Captain Generals (Palacio de los Capitanes Generales), City Hall, San José Cathedral, Santa Catalina Arch and La Merced Church. Return to Guatemala City time to enjoy lunch with your guide at a local restaurant that serves typical Guatemalan dishes. Continue your tour visiting Guatemala City, or La Nueva Guatemala de la Asunción, as it’s formally known. Starts on Avenue of the Americas (Avenida de las Américas). Next, head to the Civic Center (Centro Cívico). Continue your tour to Constitution Plaza (Plaza de la Constitución), the heart of Guatemala City’s historical center. See surrounding landmarks like the National Palace of Culture (Palacio Nacional de la Cultura), the National Library and Metropolitan Cathedral (Catedral Metropolitana), which was originally built in the late 1700s. In the morning, after breakfast, depart with your group for Chichicastenango, also known as Santo Tomás Chichicastenango. 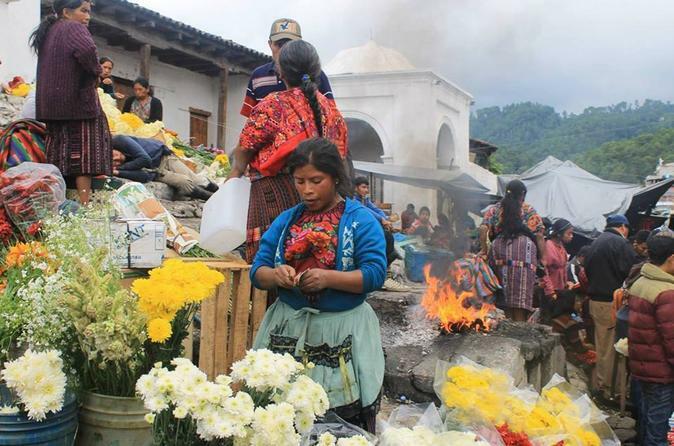 This pre-Hispanic town of cobblestone streets and red-tiled rooftops, situated in the mountains of Quiche above 5,000 feet (1,500 meters), is renowned throughout the Americas for its picturesque outdoor market. Next, visit the adjacent Santo Tomás Church, where shamans have burned incense and candles in their rituals for 400 years. Free time for lunch. After your guided tour, continue to the town of Panajachel on Lake Atitlán (Lago de Atitlán), one of most beautiful places in the world! Isolated in the Guatemalan highlands, you’ll catch breathtaking views of three surrounding volcanoes. Return to Guatemala City. At your hotel, enjoy breakfast and then get ready to be dropped-off at the airport for your return flight. © 2019 Hello GuatemalaCity - All Rights Reserved.